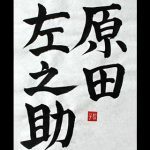 Japanese Kanji Symbols about Shinsengumi. 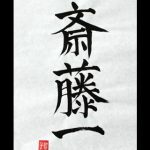 I wrote “Hijikata Toshizou”. He was the vice-commander of Shinsengumi. 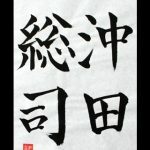 Hijikata is two kanji symbols in right. It’s the family name. 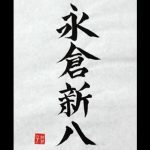 Toshizou is two kanji symbols in left. It’s the first name. His nickname is “Oni no Fukuchou”(Demon Vice-Commander). He was handsome and cruel. Who is your favorite person in Shinsengumi? I’m waiting for a request. 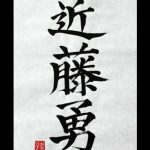 I wrote “Shinsengumi”. They were a special police force of the Late Tokugawa Shogunate. 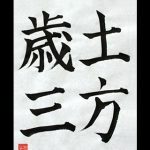 “Shin” means New “Sen” means Compose “Gumi” means Association Hijikata, Kondou, Okita, They are very famous. We like Shinsengumi and Akou-Roushi (Forty-seven Samurai) equally, in Japan. Who is your favorite person in Shinsengumi? I’m waiting for a request.